Japeth slams one home for Ginebra. Semifinal action kicked off with explosive action last night in the 2016 PBA Governors’ Cup as Ginebra rallied from a double-digit deficit to draw first blood against San Miguel Beer! 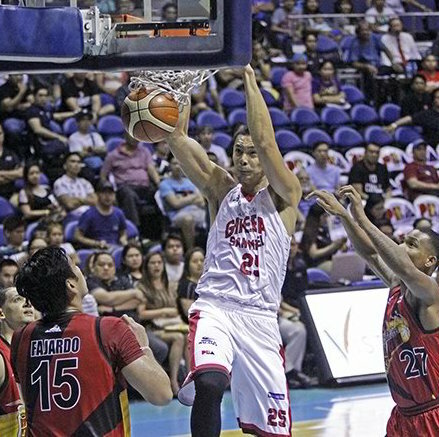 The Barangay Ginebra San Miguel Kings came up huge when they needed it as they stunned sister team San Miguel, 115-108, to take the opening game of their Oppo PBA Governors’ Cup semifinal series on Monday at the SMART-Araneta Coliseum. Import Justin Brownlee exploded for 39 points and 16 big rebounds while Japeth Aguilar added 22 points, seven rebounds and three blocks for Ginebra, which now leads the best-of-five series, 1-0. Despite the absence of star center Greg Slaughter and a rough night from LA Tenorio, the Kings’ quarterfinals hero who missed all nine of his shots to go scoreless in over 31 minutes of play, the Kings pulled through thanks to big efforts from several players. Sol Mercado scored 19 points, including three three-pointers, from off the bench while Joe Devance chipped in with 12. Rookie Scottie Thompson had a huge night as well, logging 11 points, 10 rebounds and six assists in the win. Elijah Millsap had a huge triple-double for SMB with 29 points, 14 rebounds and 11 assists but shot only 43-percent from the field. BPC and MVP favorite June Mar Fajardo finished with 25 points and 15 rebounds in the loss. Justin Brownlee (GIN) - 39pts, 16rebs, 2stls, 1blk, 2 triples, 17/27 FGs. Elijah Millsap (SMB) _ 29pts, 14rebs, 11asts, 3stls, 2 triples, 13/30 FGs.